The innovation of technology creates vivid visual experience. New designed NCP-P400 improwes the stress free system and reflected illumination sysem,more vivid image is available as the polarizing performance ameliorates.Green manufacture in full operation based on HSF environmental policy.With various ergonomics designs,easy and comfortable operation is available. --Infinity Color Corrected Optical System With Newly Upgraded Koehler Illumination System, Presents Clear & Bright Micro-image Under Each Magnification. --Fire-new Ergonomic Design, Steady System Structure, Easy Operation, Suitable For Various Working Environments. --Newly Designed Integrative Y-Shape Body, All Metal Diecasted Under High Pressure. High stability, No Image Dithering Under High Magnification Observation, Ensures The Test Precision Of Multi-channel Fluorsecnce Diagnosis. --Intermediate Tube With Removable Internal Bertrand Lens, Analyzer And Compensators. Intermediate tube With removable internal Bertrand lens, analyzer and compensators. 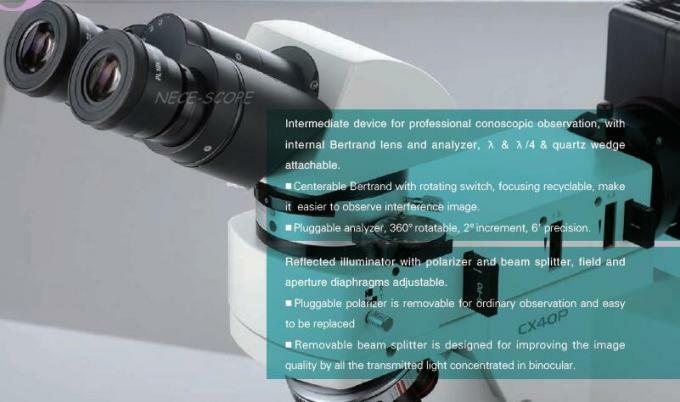 Bertrand lens with totating switch, centerable, focusing recyclable. Y shape root structure,high rigidity and high stability. Building block concept,detachable and flexble. Special surface processing technics,beautiful and practical. Optimized illumination system,energy efficiency and environmental protection.